July 14, 2015 by Ecommerce News. About Logistics with tags The United Kingdom. 3066 views. For online shoppers in the UK, value for money is still a big issue. Unexpected delivery charges have a big impact on purchasing decisions and one in four shoppers are likely to wait for a special sales event before placing an order. This is apparent from the 2015 Delivery Matters report by Royal Mail. UK online shoppers say 86% of their overall shopping budget (€469) goes towards online purchases. This share was just 80% last year. Now 405 euro is spent online, compared to 387 euro in 2014. But at the same time online shoppers are ‘increasingly canny’. They wait for a sales event, like Black Friday, before placing an order and, even if it’s free, most shoppers still prefer free home delivery to picking up in-store. With regards to the most popular type of products that are purchased online, there are no real changes. 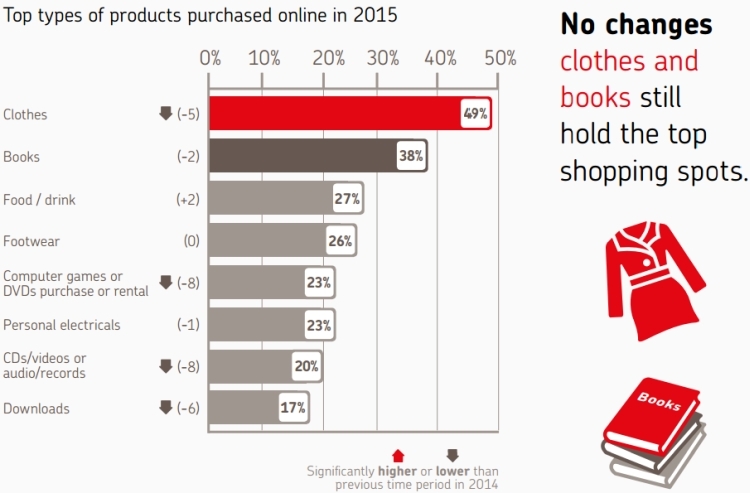 Clothes and books remain the most popular products consumers shop online. Shopping with mobile devices is on the rise. Desktop usage in the last three months declined by 5 percentage points (from 46% in 2014 to 41% now), while shopping online from a mobile phone (22% -> 24%), tablet (19% -> 24%) and laptop (60% -> 65%) increased. The report also shows 81% of online shoppers use online marketplaces and they are used more of less equally by all genders and ages. “Delivery has a big impact when online shoppers consider which marketplace to use. 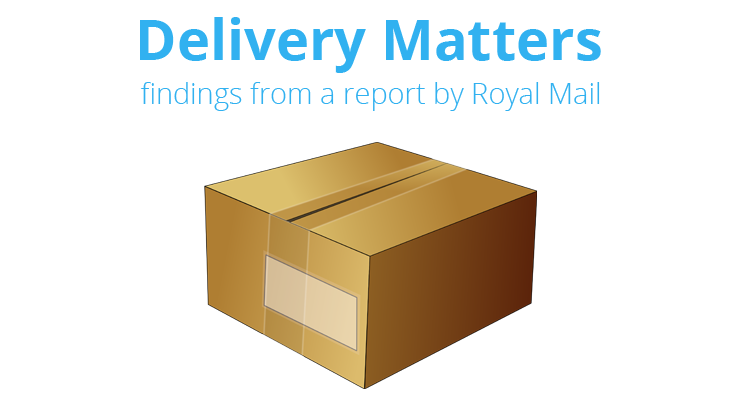 They weight the rating for delivery almost as highly as the marketplace’s overall rating when making shopping decisions”, Royal Mail states. As a matter of fact, 63% says the delivery ratings of the marketplace seller are quite to highly influential, while 69% says the overall ratings are quite to highly influential. When it comes to delivery, 71% of online shoppers say their home remains their preferred delivery location. Almost a third (32%) would pick a neighbor’s house, if their own home isn’t an option, while 17% would pick the Post Office in that case. What may come as a surprise though, is the fact that the most trusted delivery location other than the consumer’s home is the Post Office (75%), even more than the house of friends or family (73%) and also more than a neighbor’s house (56%). More than half of online shoppers have used click and collect. Most said they chose this option because it was free. If it wasn’t, most online shoppers would go for home delivery. So click and collect is primarily used because it’s free, not necessarily because it’s convenient. 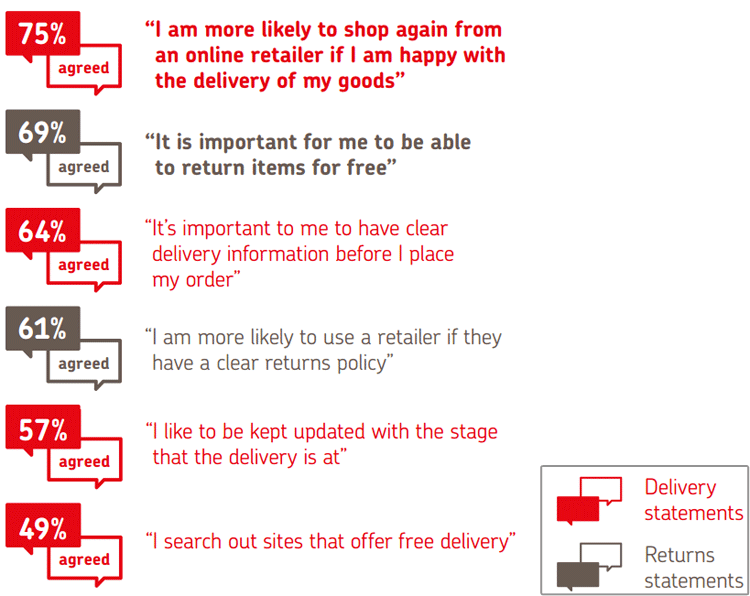 Royal Mail also asked respondents what they expect from retailers. And it seems that after all, delivery matters. Fewer shoppers are abandoning their cart, so according to Royal Mail “it seems the tactics retailers are using to encourage shoppers to complete their purchases are finally bearing fruit”. When respondents were being asked what their reasons were for abandoning a shopping cart, most of them said they weren’t happy with the delivery charge, they were just browsing or they found a better deal elsewhere. And those consumers who abandoned a cart because of delivery charges are more likely to go to a different retailer, one that offers free delivery. This data shows how important it is to give crystal-clear delivery information to your customers.